"Il carnevale di Venezia" (or "The Carnival of Venice") is a famous folk tune and has been the subject of many varied arrangements and transcriptions. 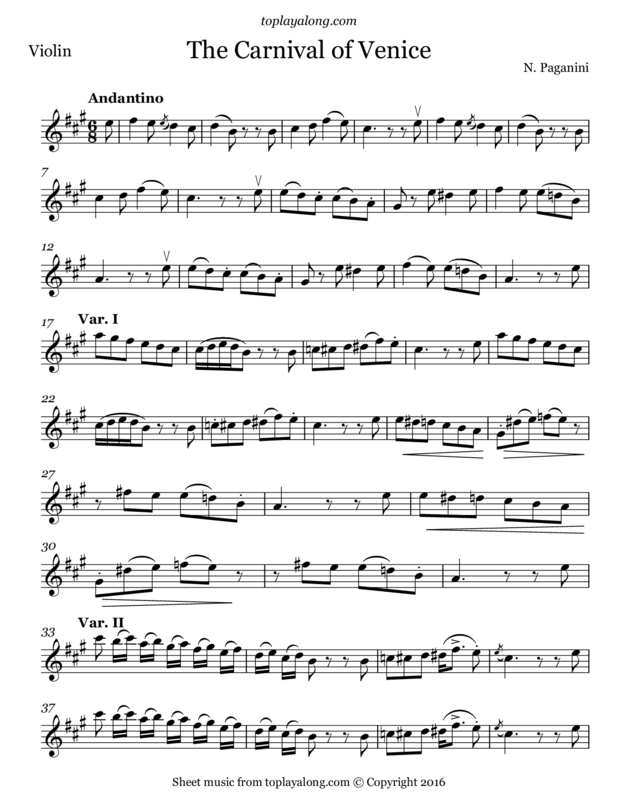 In this piece, a series of theme and variations has been written by Niccolò Paganini for solo violin, as "show off" pieces that contain virtuoso displays of violin techniques and fast tempos. Italian violinist, violist, guitarist, and composer. He was the most celebrated violin virtuoso of his time, and left his mark as one of the pillars of modern violin technique. Because of his widely rumored association with the devil, the Church denied his body a Catholic burial in Genoa. It took four years and an appeal to the Pope before the Church let his body be transported to Genoa, but it was still not buried. His remains were finally laid to rest in 1876, in a cemetery in Parma.